This book is the fruit of Fr. 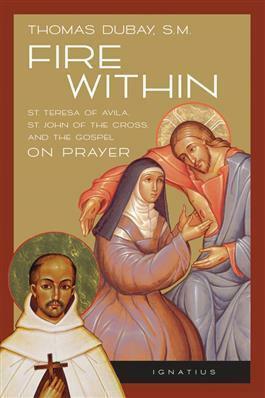 Dubay's many years of study and experience in spiritual direction and in it he synthesizes the teachings on prayer of the two great doctors of the Church on prayer--St. John of the Cross and St. Teresa of Avila--and the teaching of Sacred Scripture. But the teaching that Fr. Dubay synthesized is not collected from Teresa and John for contemplatives alone. It is meant for every Christian and is based on the Gospel imperative of personal prayer and the call to holiness. All the major elements of these great teachers are ordered, commented on and put in the context of their scriptural foundations. Here is an outstanding book on prayer and the spiritual life written by one of the best spiritual directors and retreat masters of our time, and based on the writings of the Church's two greatest mystical doctors. "This book is a gold mine for any Christian intent on making progress in prayer. Any reader who appreciates the relevance of the spiritual in these troubled times will find Fire Within difficult to put down. A work of art by a master of the spiritual life." Fr. Thomas Dubay, S.M., is a retreat master and spiritual director for religious communities around the country, as well as a highly regarded speaker at conferences and retreats for lay people in North America. He has hosted five different 13-part television series on the topics of spirituality and prayer, and is the best-selling author of such acclaimed spiritual works as Fire Within, Prayer Primer and Happy Are You Poor.